You will need some paint and glass mason jars. I bought paint samples from Lowe’s for mine, but you can use acrylic paint if you like. This time instead of buying the Ball brand jars, I bought Walmart’s generic version. 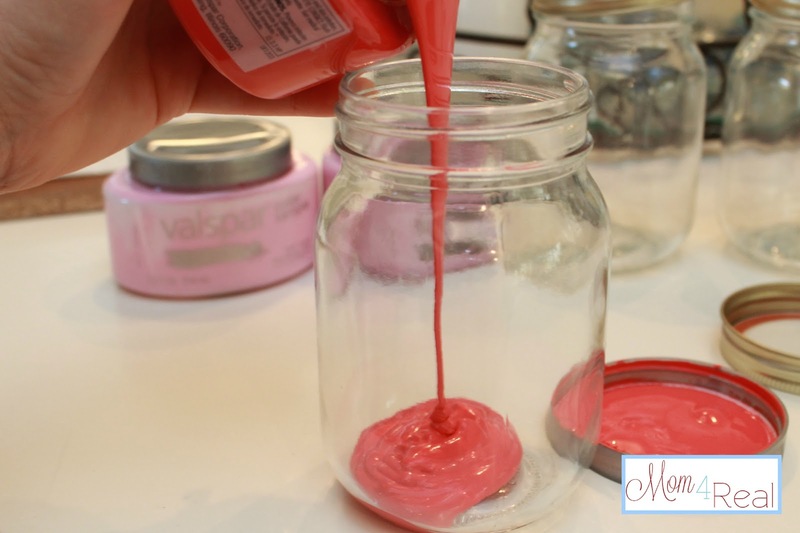 Start by pouring paint in the jar. If you want to take your time swirling and twirling your jar around, use less. 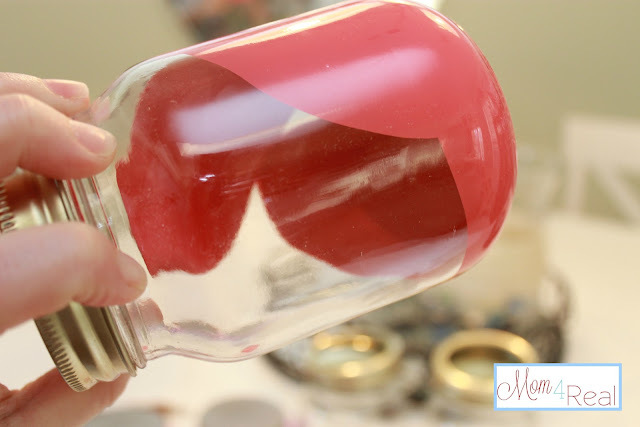 If want it to go a little more quickly, use more and pour back into the paint container once the all of the glass is covered. I like to use less paint and swirl it around slowly…just make sure to cover the entire inner surface. 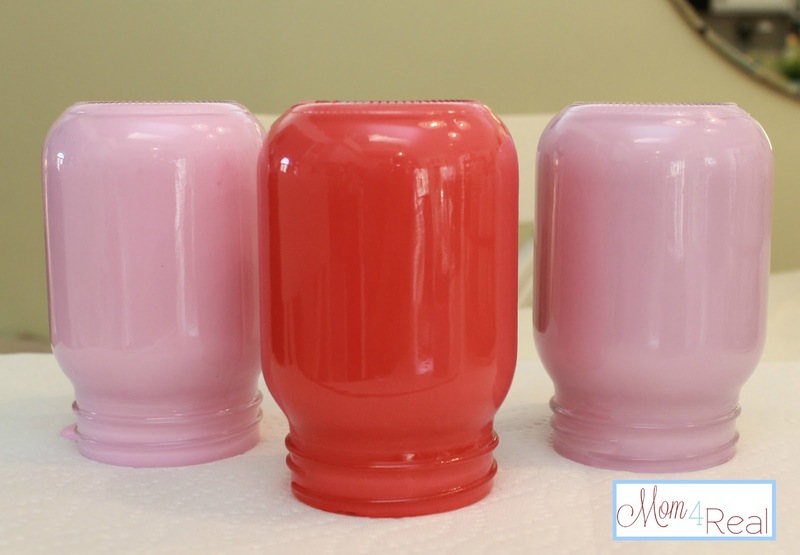 Now flip your jars over and place them on a few layers of paper towels to drain the excess paint. I placed my paper towel on top of a piece of wax paper so the paint wouldn’t leak through onto my table. You can’t necessarily use these vases for real flowers, but think of all the other fun uses. And…aren’t they so cute and colorful? My friend Debbie at Refresh Restyle made some using old bottles, and they are gorgeous…go check them out! Yup! Stealing this easy and brilliant idea from you too! Love then Jess! Great job hun! Don’t you just love those little paints from Lowe’s! I do :) Love your painted jars! I know Kate is going to love her room makeover. Thanks for sharing my painted jars. Love it Jessica!! !….Can’t wait to see the jars in your daughter’s room….! Oh- those are perfect! They add a great lil touch of color- love them Jess! So Cute, Jessica. I have painted mason jars on the outside, but have yet to try it on the inside :) I will have to give it a try. These remind me of my old paint mason jars I used in my college painting classes. They held my brush cleaner and the sides were all coated with color! Good memories! 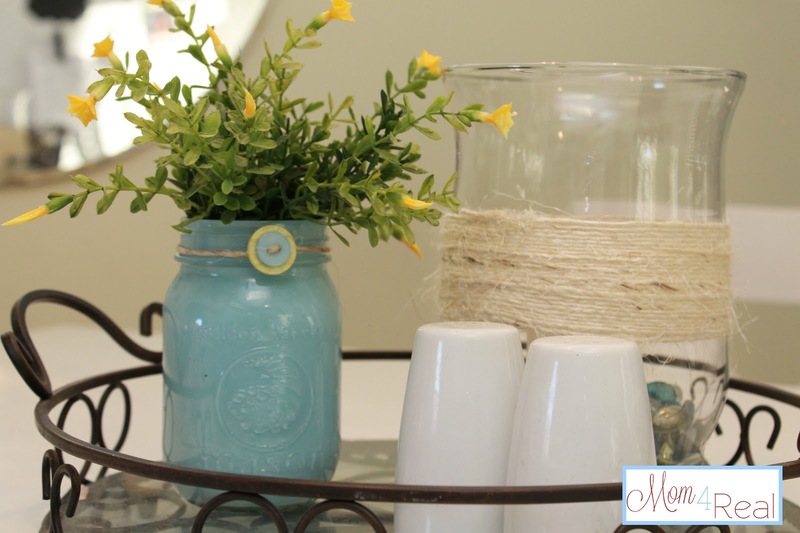 What darling embellished mason jars… and such happy colors! Oooh … I have a bunch of jars I can try this on! Love the colors! I have tried this with craft paint, but it never seemed to work. I think I need to hop to Lowe’s for some paint samples! Have a great weekend! LOVE LOVE LOVE! Happy color too Jessica. I love your technique too. I just spray paint them, but clearly this turned out prettier. Happy Saturday. I cracked up at your other post about changing your schedule. Girl, there is no way I could stick to a schedule. 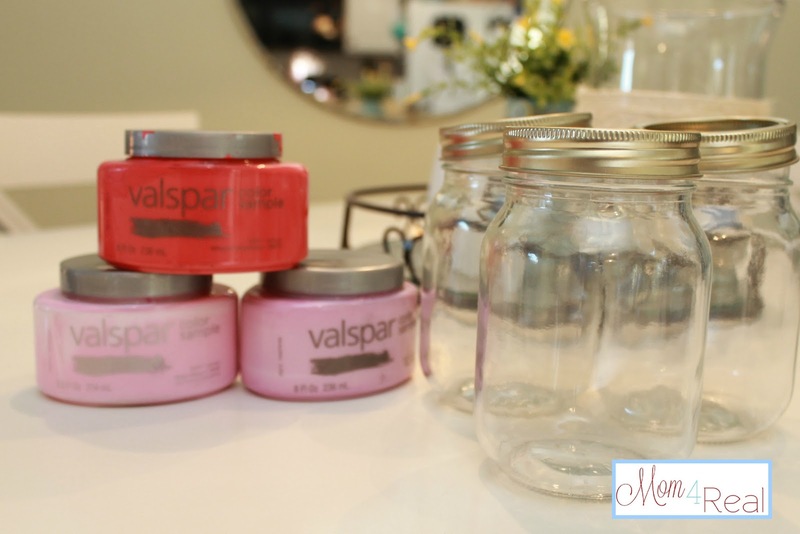 I saw these jars featured on Tater Tots & Jello, I’ve been eyeballing them on Pinterest, I love this idea and must try it! Thanks for sharing. Had no idea it was so simple to paint these from the inside! Thanks so much for sharing! 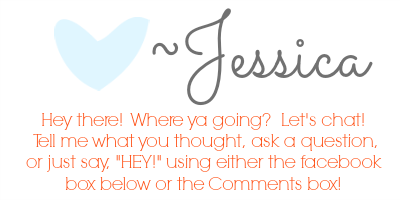 Very cute, love your blog especially your blog design!! Please let me know if you ever would be interested in designing my blog in exchange for free sponsorship!! I would LOVE that! These mason jars are so pretty. Great idea! 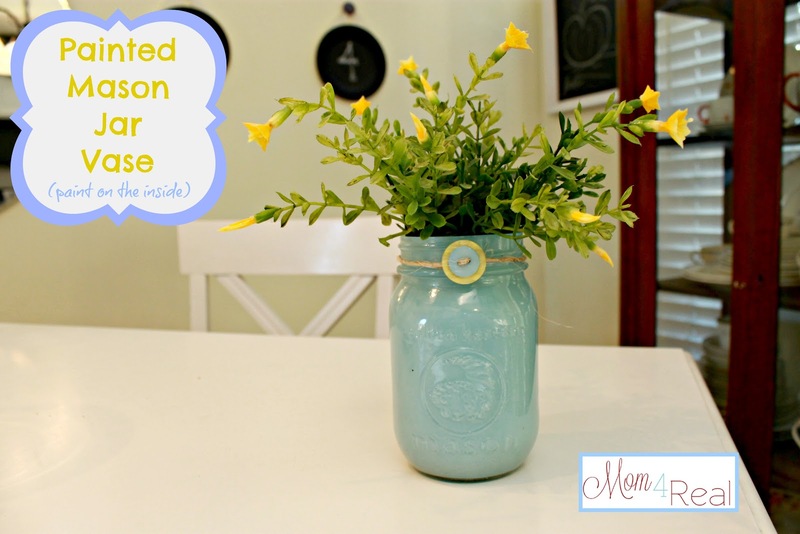 What a delightful idea to take something as ordinary as a Mason jar and make it so special. The jars turned out so cute — great idea! These are adorable! Question, though – does the paint scrape off if you put something “poky” inside? Hmm, haven’t ever found paint samples at our Lowes. Was just there today in the paint isle today to pick up some glazing. Hey Deb! Try turning them upside down on wax paper…they wouldn’t stick as much I bet. Good luck! Hi, I am going to paint up some mason jars to use as lights outside,,,meaning tea light or the little ones in a jar inside . If i paint inside with basic lowes paint, will it be flamable if painted inside instead of out?? I’m not sure, but the paint may be flammable. You could always the battery lit tea lights. I bought a ton at the Dollar Tree. Oh now I’m addicted…this is going to be seriously bad. Thanks for sharing! Will paint hold up in side a jar when water is put init or when it is washed.? My paint is thick..Should I put something in it to thin the paint? Hi! I have tried this with acrylic paints and when I turn the piece over, paint slides off glass in spCes, leaving clear glass behind…not full voverage. Do you think it is the paint? Have you only done this with interior wall paint? The interior wall paint is definitely a little thicker and works better, but you can achieve the same thing with acrylic paint…you may just have to do a few coats and let them dry in between coats.